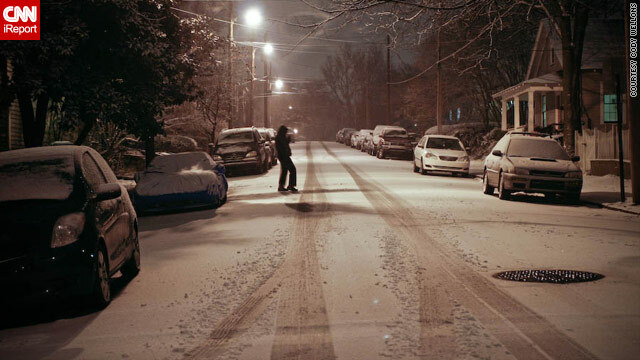 A light dusting of snow covers the streets in Atlanta's Grant Park neighborhood Thursday evening. Atlanta, Georgia (CNN) -- The Deep South joined most of the rest of the nation in the deep freeze early Friday, as a fast-moving cold front knifed its way down to Florida. Combining with moisture from the Gulf of Mexico, the frigid air dumped a dangerous mix of ice and snow throughout the southeast, coating roadways with a slick glaze. Numerous school systems throughout the region shut down. At least nine deaths around the country have been blamed on the round of winter weather this week. A 50-year-old woman in Acworth, Georgia, died overnight when her car apparently slid off a road and hit a tree, said Lt. Jay Baker of the Cherokee County sheriff's office. Authorities and CNN affiliates have reported eight other deaths in Missouri, Tennessee, Mississippi and South Carolina. There was also a vehicle crash in Ohio on Thursday that killed four people who had been in a school special needs van. The crash took place in slick conditions, but authorities said Friday an investigation was under way and the crash had not been linked officially to the weather. There was no immediate relief in sight Friday. Forecasts said the frigid was likely to stay through the weekend, with warmer temperatures ahead early next week. Around the country, numerous dramatic stories of people's struggles with the biting cold popped up. A driver in Aurora, Illinois, thought he was going to die when a huge chunk of ice slammed into his windshield. "The impact was so bad and the pain was so severe," Peter Marano told CNN affiliate WGN. A large piece of ice fell off the top of an oncoming truck and exploded in the air, sending a chunk into the driver's side of his windshield, WGN reported. It left him stunned and nearly unconscious. His face is now covered with stitches. The reported deaths included two in Missouri. A homeless man in Kansas City was found frozen to death, CNN affiliate KCTV reported. A woman in Advance, Missouri, was killed when her car ran into a ditch, CNN affiliate KAIT reported. At least four cold-related deaths occurred in Tennessee, including an 81-year-old Alzheimer's patient in Nashville who apparently wandered outside at night, police said. In Lauderdale County, Mississippi, coroner Clayton Cobler said a 68-year-old man was found dead of hypothermia Tuesday in his home. The man lived alone, and his heaters were found to be not working, Cobler said. In Cherokee County, South Carolina, officials said a man was found dead Wednesday afternoon in a tent behind a gas station, according to CNN affiliate WYFF. The coroner's office said it thought the man had died of hypothermia two days earlier. In affected areas all over the country, authorities warned people to be careful on roads -- and in some cases to stay off them altogether. "Motorists are urged to avoid driving until at least noon Friday if at all possible," the Georgia Department of Transportation said. "If travel is absolutely necessary, wait until after daybreak to be able to see and avoid black ice." More than two dozen cars were involved in a pile-up overnight at an interstate entrance ramp in Atlanta. Air travel around the country was affected Friday as well. Delta offered weather travel waivers to Delta and Northwest passengers on flights to, from or through Alabama, Arkansas, Georgia, Mississippi or Tennessee. Temperatures in Memphis were their lowest in more than a decade, said CNN meteorologist Rob Marciano. "You have people not used to this weather, and homes are not built for this weather," he said. The city turned on heat for people unable to pay their utility bills, he said.